I'm having a mint moment, and it's not just a craving for girl scout cookies;) Mint colored handbags are on the "it list" for spring and they are coming in prices budget to bank breaking. So, although I'd love a little Lanvin, I think I'll be heading over to Nasty Gal for my minty fresh fix. Oh my God. That Rebecca Minkoff mint bag is to die for! Love it! But, love Rebecca bags! LOVE the loeffler randall bags, such a nice structured style! I love that color! Have my eye on that Asos clutch already! Love love the Rebecca Minkoff one! I just picked one up from JC Penneys for $20 and it looks like a designer bag! Love your choices! I'm still loving mint too. Love the Loeffler Randall bag! i think i like the ASOS one best! such a great color. Sighh, that Loeffler Randall bag is gorgeous. I need to pick up a (less expensive) mint purse ASAP! These are really beautiful, I love the second one. I was just looking at the mint bag from ASOS last night:) You've shown some really beautiful options!! I'm kind of in love with all of your picks but I've wanted the Loeffler Randall for awhile now! Mint is such a perfect color for spring! Anya Hindmarch's minty number is my favourite of the lot! love the colour. I'm loving mint for spring as well. That Anya Hindmarch bag is so gorgeous...totally out of my budget, but gorgeous! Mint green is such a beautiful hue! I'm so in love with all of these bags, especially the Loeffler Randall one! Excellent trend. First mint pants, then mint nails, and now bags. Loving the mint. I love this color! And I need a handbag for spring! i love this color! I just found your blog and I love that! 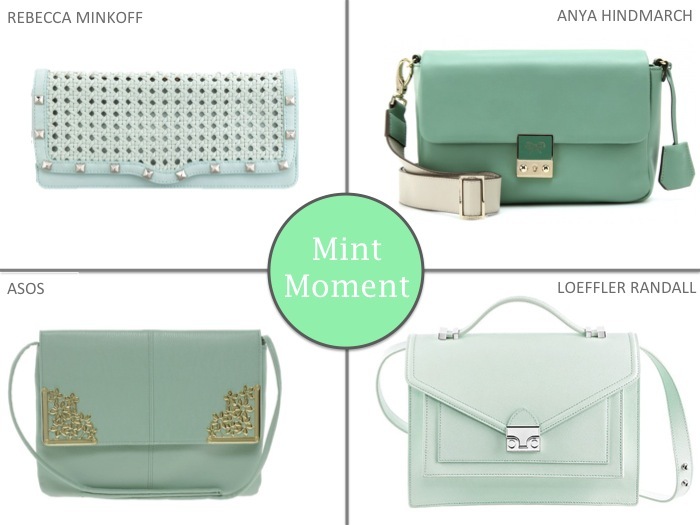 Seriously loving these mint bags! This is such a great collection you put together, lady! Mint colored handbags are very nice, I like it but it would be gorgeous handbags for every women. Thanks for the site & nice bags.